I’ve never been in a situation (aside from river fishing) where I needed to drive a mile to the lake from the venue reception, but that is the case in Todber Manor Whiteposts lakes. On leaving the tackle store I was given a handy print out with idiot proof instructions on how to find the lakes, and was told “It is exactly 1 mile away”. Okie doke! The Todber Manor complex has several lakes, all boasting a range of fishing types. There are several specimen carp lakes another lake which Golden Catfish (judging from the website photos) a designated match lake and 2 general coarse lakes (one of which I intended to fish). I had rung in advance to ask what lakes would be available to fish, in the off chance of a match being on. Good job I did as there were matches on both Park lake and one of the White Posts lakes. I did wonder if this was part of the mini league I have read about in other anglers blogs, but never managed to get around to asking the match guys as they were well underway by the time I arrived. Lots and lots of options for me on this peg. 1. Corner swim at 7 meters. You know that disappointed feeling you get when you are unprepared – that’ s what happened to me when looking through my box and rigs. I had one silvers rig and one carp rig capable of being used, and to be honest, the carp rig had seen better days, so knew I would end up making a few more on the bank at some point. Not my favourite pastime… With that in mind I clipped up my bomb rod, thinking I would sling this out while making rigs, in the mean time I would start off fishing double red in open water at 7 meters. 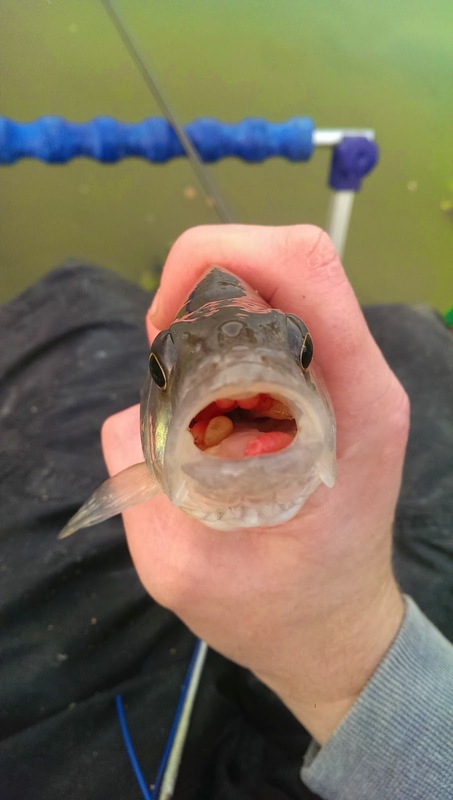 Despite fish jumping everywhere, the bites weren’t instantaneous, but within a minute or 2 the float slipped under and I was into a small roach. First fish! Not a blank! I shipped back out with double white, and catapulting a pouchful of maggots over the top meant the bites came a lot quicker. The next fish wasn’t a roach and it charged off to the right. My 8 -10 elastic wasn’t up to the job for this lake, and I was fortunate enough to get back an intact rig which stayed firmly in the roost for the rest of the session. Shipping back my pole knocked my spray bar and 3 carp were spooked from beneath my feet! I swapped top kits and shipped out a heavier rig with some sweetcorn on the hook. Despite all fish jumping and whizzing about I didn’t register a bite for 5 minutes! A bit despondent I opted for a banded 6mm Halibut pellet, and shipped out towards the large pipe (a great feature in the corner), with a ball of softened micros for feed. The liners were instant this time, and before long my float was being pushed around, dragged under and bobbing. A minute or 2 later and it disappeared, on and striking I was into a carp. A nice fish round about 4lbs. Shipping out using the same tactics the next bite was much quicker, and no sooner had I dropped the bait in than something took it, and headed off around the wrong side of the pipe. Fortunately I got the hook back but the haired part of my rig was long gone! Rig making it was! I banded a pellet onto my bomb rod and slung it out next to the lilies. The bites were just as frequent and before long the rod was registering a steady knock. At this rate I may have to down tools, make some rigs and then carry on. 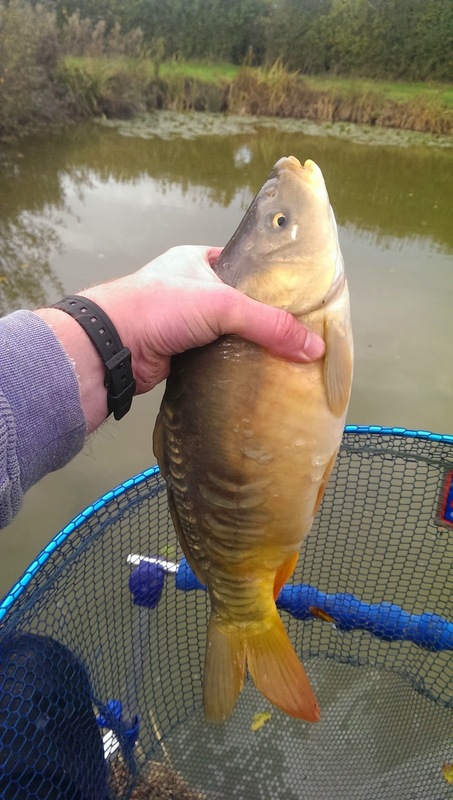 I wound in a small F1, but on bringing it to the bank I spooked another group of carp in the margin to my right! I dropped in cricket ball size lump of micro’s and hoped it would bring them in again. Casting out again I put the rod down, picked up a spool of line, but before be able to reach a bait band the rod ripped around. 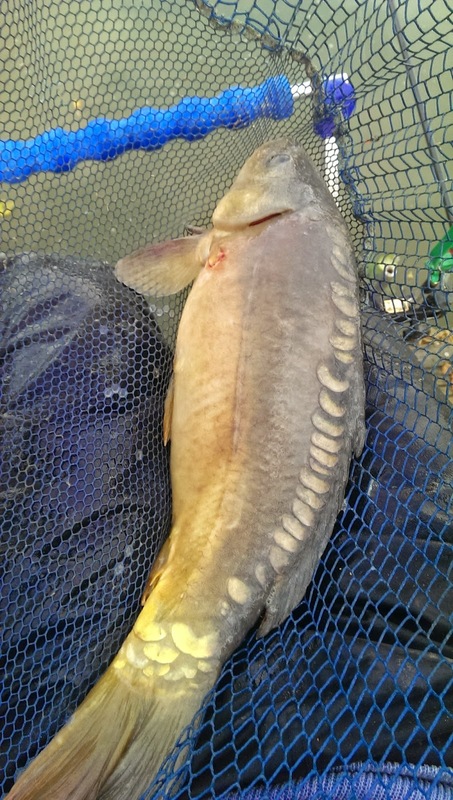 This was a better fish than the previous F1 and I brought to the net a carp around 5lbs. 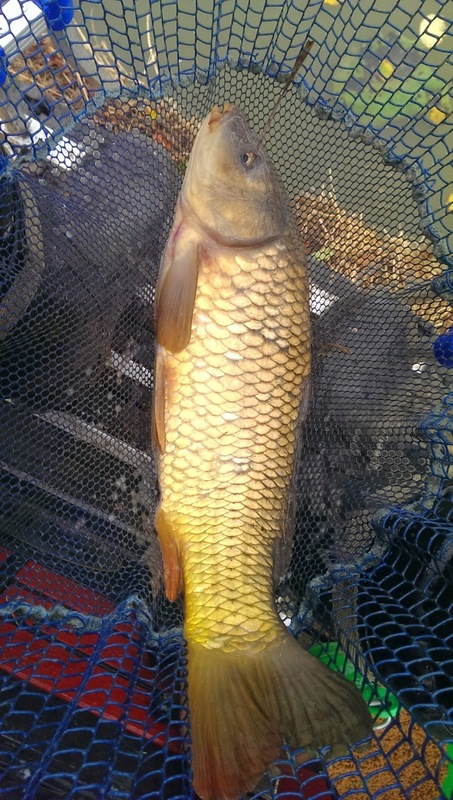 Banded pellet seems to be doing the business and within 10 minutes I had managed another 2 carp around 4 or 5lb’s. There were fish everywhere, and the only way I was going to get back on the pole was to stop what I was doing, makes a few rigs and carry on. This is not a session where I would get a “quiet spell”. After 2 more fish on the bomb I decided to wind in and started making up short margin rigs. Plumbing up earlier had shown me there was a marginal shelf at about 18 inches, which went from 12 inches down to depth of 3 feet (which it was for all my other swims). 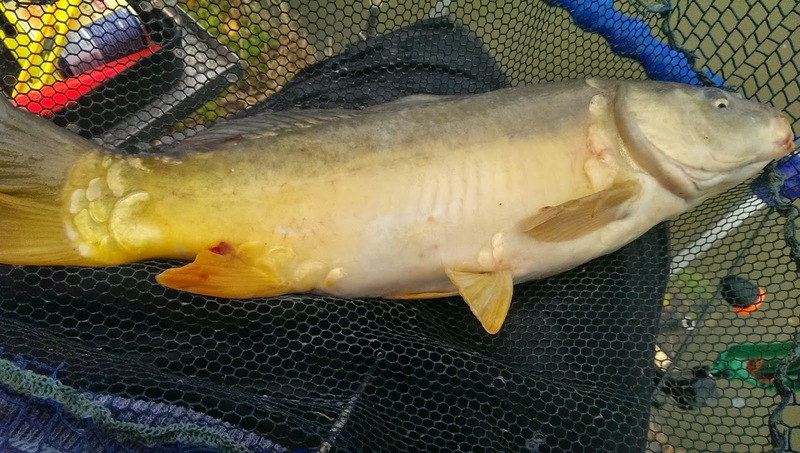 My earlier indecision about swim area and my unintended rig making session meant I was a little bit annoyed how long I had spent not actually fishing (note to self – MAKE MORE RIGS) and looking at my watch, time was ticking on for 1pm! Nightmare! I had been throwing handfuls of maggots into the right hand margin and now there were plenty of fish rooting around down there. I set up my top 4, hooked up 4 dead maggots and lowered them in amongst the swirls. The float was being pushed and pulled by feeding fish, but within seconds something had snaffled up the dead reds and I was in. 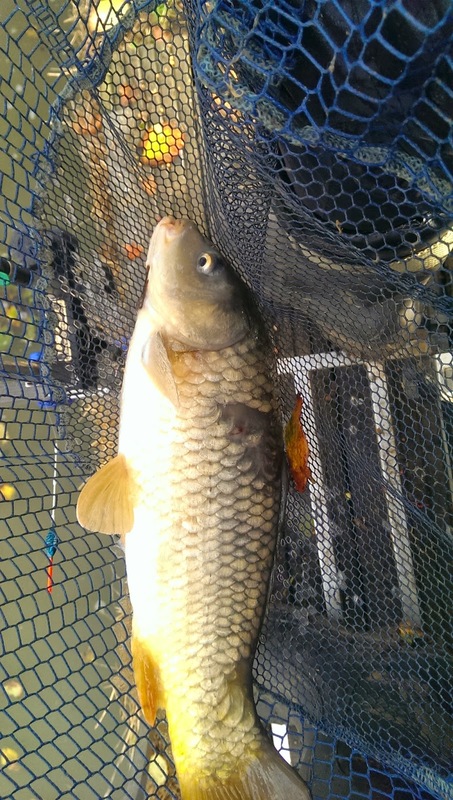 The fish charged off, but after the initial surge I was surprised how quickly I got it in the net. I think the fish was surprised too, because it went banana’s in the net, as did a lot of the fish today. I would go into more detail on the number of fish that I caught between 1pm and 3pm but it was mental – absolutely nonstop. I gave up taking photos and lost count of banked carp, although I lost at least 7! 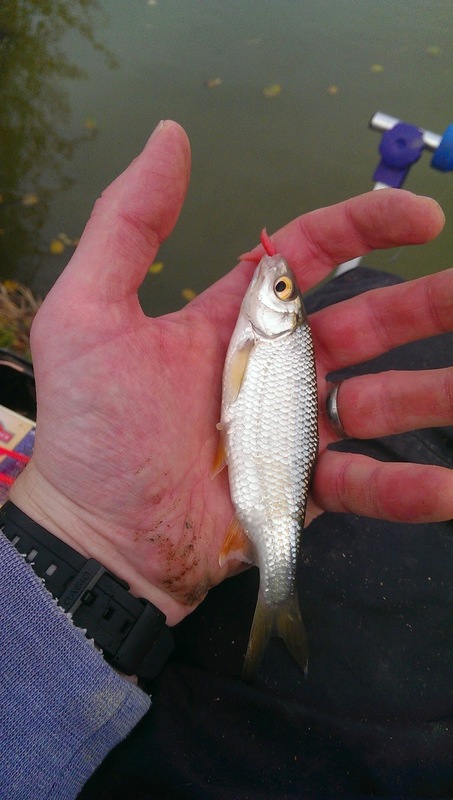 4 dead maggots were doing the business and after every fish a lump of balled micros were introduced. 30 seconds later and any spooked carp would reappear and would be gorging again. I do regret not having my polarised glasses, although I could see the fish, it would have made things that little bit easier when dropping bait in to their path. 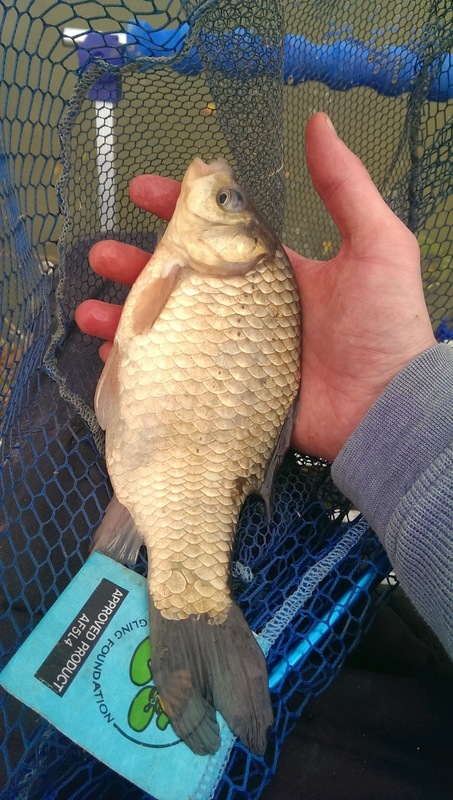 The carp weren’t the only fish in a feeding frenzy, I managed to catch a very greedy perch which emptied the content of its stomach into my hand when landed. At least a dozen maggots! Here’s a few that were photographed including a VERY greedy perch! 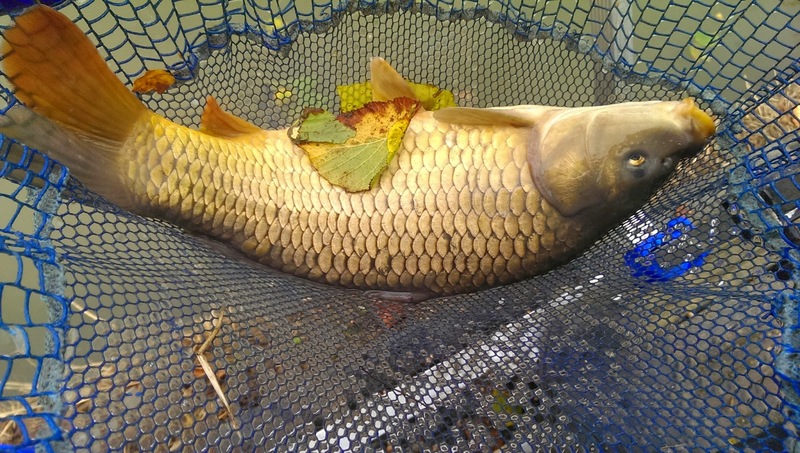 The Carp were all solid weight builders with the smallest being around 4lb and the biggest (at this point) coming in a 9lb. The margin however was taking a hammering and it slowed down at 3, I dropped in some more feed and I switched back to the pipe line at 7 meters. A 8mm banded pellet was shipped out I and carried on catching where the margin left off. The first fish was a mirror just over 10lbs. Considering we are now in November, I was feeding as heavily as I would have in summer, and these fish were cleaning up everything. 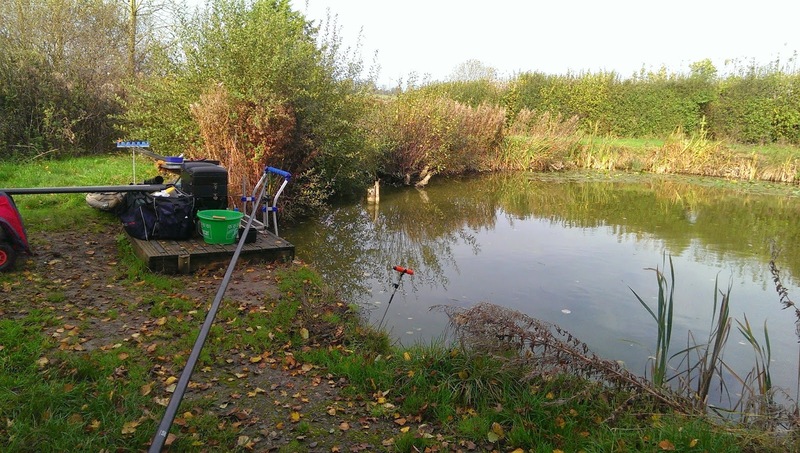 I managed another 9 – 10 fish between 3pm and quarter past 4 (during which time I heard the “all out” whistle of the match, but never managed to ask what won), and with 1 last roll of the dice I caught 3 “final fish” back down in the margin. Last fish of the day, from the margin! All of which were caught on the same dead maggots! By the end they were basically transparent, but I had been slowly packing up and the very little amount of hookbait I had left had gone into the margin. It was also getting darker quicker than I expected so I hastily finished off packing and managed to get my gear into the car by quarter to 5, at which point the heavens opened… Phew! Todber Manor. Where to start really… What a venue. I haven’t caught that many sizable fish for a long while, it is easy to see why people rave about it. The lakes that I fished were also quite accessible to disabled anglers, which is a large plus. Admittedly the walk to my peg wasn’t a long one, but wouldn’t be wheelchair friendly, but I did choose the furthest possible peg from the car park. The first lake however backs on to the car park, and all the pegs have are stable pallets which could easily accommodate a wheelchair. You may even be able to reverse down to your peg. If the lakes are equally stocked as I have been told you could bag up from any one of them. I will have to visit again to review the other match lakes, but this one was a flyer, and will hopefully take my father in law there in the not too distant future! (Get your gear ready Jeff!). Coming in at £7 it is also a very reasonable price for a very busy day out. Being a mile from the venues reception there were no facilities at the side of these lakes, then again, the action was so frantic that you probably wouldn’t have time to pee! I had to shovel down some sandwiches in between fish, the crusts of one ended up in the lake, which then got promptly eaten by the fish! I can whole heartedly recommend this venue, if you’re in the area, give it a whirl. If you’re not in the area, go to Todber and give it a whirl, I would be incredibly surprised if you left disappointed. Accessibility – **** – Easy to find, although odd that it is a mile away. I didn’t see a single Todber Manor Fishery staff member on the bank, which makes me wonder if they come around to check the lakes for paying occupants. Disabled Access – *** 1/2 – It would benefit from some BDAA designated pegs, but the pegs they have are comfortable enough to accommodate any wheelchair and the banks around the lakes are easily manoeuvrable with very little assistance. 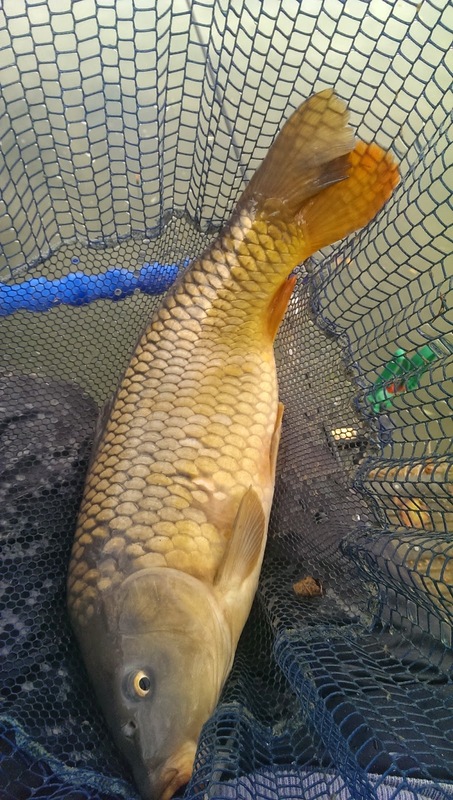 Next story Trip #68 – Higher Kingscombe – Lodge Lake – Fits and Starts and Starts and Fits.